Last week we focused on draperies and then we took a break to deal with some common window treatment problems. Today, the topic is Roman Shades. Years ago, I used a workroom whose owner is Italian. She could not say “Laurel”– she always called me Laurrrrie. Pretty much. I have done valances but the number of times, I can count on two hands. To see one job where we did valances, please click here. The number of times I’ve done a swag is at most two times, but I think only once; It was a relatively loose swag. While I’ve never actually made one, I’m well-acquainted with how they are constructed. Today, I’m going to share all of that with you. They are usually a lot less money. There are different types but I’ve only done three different variations. There’s another type with permanent pleats. I forgot what it’s called but it’s too much fabric for my taste. Inside, is duh…inside the window frame and IMO usually preferable, especially if there’s a pretty window casing. Outside mount is when the shade is outside the window frame. There are a few different reasons why we do that sometimes. There are multiple shades and some are inside and some are not. There’s another shade that’s inside the window frame. That could be a roller shade, wood blinds, I’ve even seen two Roman shades together! Here are some other outside mount Roman Shades. Love the cornice over the outside-mount Roman Shade with red trimming. 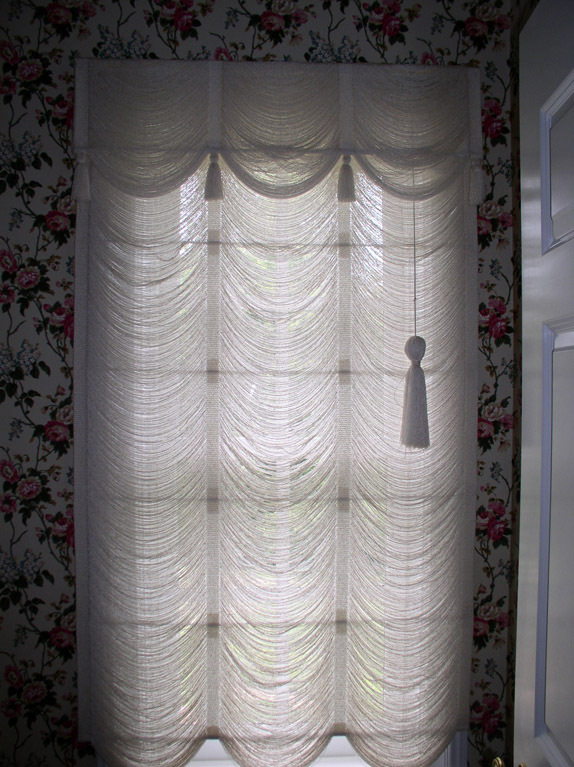 Love valance over the shade with trim detail. 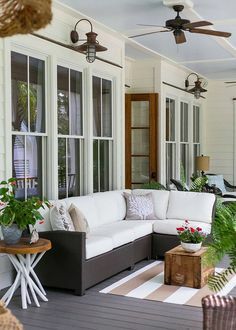 As well demonstrated in the charming room above, the outside shade should hang out about an inch on each side of the window frame. While we’re on Greek Key for trim, here are a few more. Just because I love it so! This is actually a roller shade, but she used DUCK TAPE for the trim. Here’s the tutorial. I cannot find who did this, so if anyone knows, please tell me. It gives a clear diagram of how to apply a Greek Key border. Love this! This is a wonderful bank of Roman Shades in a sheer linen. Please note that you won’t have complete privacy. I also love the extra flap detail at the bottom of the shade. The flap is necessary any time there is a trim one wants to see on the bottom. Let’s get into the nitty-gritty. I’ve never done the kind of Roman shade with the dowels, but it’s a nice look if you don’t mind the horizontal lines. All Roman shades have rings and nylon cords that go through them to pull the shade up and down. This one above has a clutch mechanism under the board. For years, I didn’t use the clutch because one time very early on, one broke. But the last few years, Cristina has been doing them with the clutch for me and it is so much easier because you don’t have to wrestle with the cord or tie it up around a cleat in order to keep the shade up. Here’s one without the dowels and without the clutch. This is a flat fold with five rows of rings. And yes, they are sewn on individually–by hand. There is a ring tape, but that can only be used with a blackout lining, unless wants to see the tape. Please also note that one often sees the rings and/or where they are sewn on— and the cords— especially with sheer Romans. The shade is mounted on a 1″ x 2″ board is running with the wide side parallel with the window frame. If you are doing an inside mount and space is tight, you can have your workroom run the board the other way. That is what we did for the green shade above. You can have as little as 1/2″ to work with. Here is a tutorial about how to make a Roman Shade. I think I would rather eat oatmeal for a month, rather than attempt to make one of these things. If you don’t already know, the art of making these fine shades is quite detailed and the reason why custom window treatments cost so much. Usually I prefer not to use blackout lining, but sometimes it’s necessary. One of those times is when you’re using a crewel fabric. They tend to have a mess of threads on the back and when the light shines through, you’ll see them. Therefore, it is necessary to use a blackout linking. Here’s a job a few years ago, where we had that situation. I’m seeing this more and more. It’s a big production, but quite doable. Long Windows or banks of windows. When there is a mullion in between the windows we can do separate shades. or break it up between windows leaving about a 1/4-1/2″ between shades. Gorgeous bathroom with lovely sheer linen shades. This brings me to another common problem with Roman Shades. The part of the window that needs to be covered in a bathroom is the bottom, not the top usually. There are two solutions. One is to do the shade as below which we needed to do anyway. In any case, what I do for all of my Roman Shades is make a permanent pleat at the bottom and then when down, it’s not just a piece of straight fabric hanging. But then, I suggest raising it a few inches from the sill. The first two are frame. Exposing 4 or 5 inches of glass isn’t enough to see much. There is a third option which is the top down shades. I found a tutorial on how to make them. I tried years ago, to have my workroom make them and I was told they could only be done in a factory. I don’t know. Anyone have any experience with that? 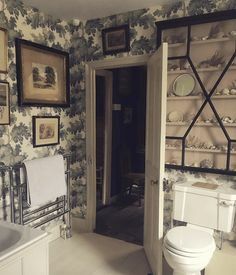 Otherwise, it is possible as in the Bronxville Bathroom to mount the shades part of the way down as in the lovely room below. This is also a situation where they broke up the long expense with three shades. Really well-done. This is a big month for me! Thursday evening, the 7th is the Westchester Home Awards where I am up for two awards for Best Bathroom. (the one above with the wallpaper) and Best Dining Room. You know the one! It is open to the public if anyone is in Westchester County and wants to come. I believe it costs $25 to get in. Mid-April is the High Point Market where I was selected to go on this special tour. I know. Holy Crap is right! 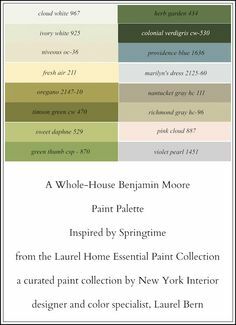 THEN on April 23rd… I will be unveiling the Laurel Home Curated Paint Collection. And man, I can’t tell you how much you’re gonna love this. 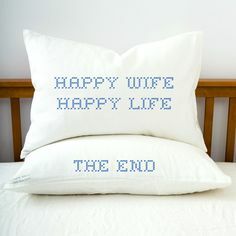 Well, I hope you will! More about that very soon. And the end of the month I am FINALLY going to Italy. I have never been but it’s been a dream for many years. I’m going with the Design Blogger folks; it’s a great group! A trip of a life-time. Hanging Draperies | For Heaven’s Sake, Don’t Do It Yourself! Design Dilemma: We Have Different Decorating Styles. Help! I am looking at Roman Shades for a couple different projects, but I can’t help from wondering, is it standard for the public view to be of the back side of the shades, curtains, blinds, or whatever you’re using indoors? When I pull up to my house and can see the symmetrical windows on either side of my front porch and the back side of different patterned curtains that don’t match, I just wonder if that’s the prettiest presentation of my house from the street. Yeah, the inside is most important, but I guess I’m a stickler for outside presentation, too, and I don’t know what the solution is, or if I’m just being too picky!!! The other situation in which I’d like to use Roman Shades is in my husband’s office. He has a glass window in his office, and on the other side of that window is the hallway that clients would pass through. Is it fine for them to walk past and see the back side of shades with all the cords? Or does it really not matter? I’m obsessing over making the public side perfect. I think he needs privacy, of course, but looking at that picture you posted above of the back side of shades, I’m second guessing if that’s the best type of window covering to use when people will be walking right next to the window and see all the cords and the mechanism at the top. Thanks so much for your kind words and order! Antique Drapery Hardware is in the rolodex and has C-rings. In fact, I get all of my rings there. They sell retail and also to the trade. I went on a search for them. Is this what you mean? The itinerary and guides for Italy sound fantastic. I’m keeping my fingers crossed for you for the Westchester Designer Awards. Thank you so much! I’m shocked that I’m even in the running for anything. So, I’m fine whatever happens. Great inspiration here- I love Roman shades ! Good luck on your wards and we will just mad each other in Italy. Have fun!! Thank you Laurel for the wonderful insight on Roman shades. On another note- in reference to your award winning bathroom is the white paint cotton balls? Exquisite! You seem to have quite of following of workroom owners! As one of them, I so admire that you actually know the technical end of window treatments. Not every designer does! One thing I noticed for the photo of the shade from Leatherwood Design (I call the owner, Deb Cronin, the queen of roman shades. She’s amazing!! ), anyway back to the photo of her shade…it most likely does have a clutch, but the mechanism is to the front of the shade and is then covered covered with a short valance. (You can’t see it because the photo shows the back of the shade.) This is called a reverse mounted shade. You can tell because of the eyelets near the top is where the lift cords switch from the back to the front before threading into the clutch. Reverse mounting means the shade can hug the window as it comes off the back of the mounting board. This is sometimes preferable design-wise. Deb’s shade also shows ladder tape that the lift cord runs through. This is one of the solutions that makes it child-safety compliant, something the other workrooms commented on. Without it children have died as a result of getting their heads caught behind these cords, or in those that hang on the side of the shade that raise and lower it (if not held down with a tension devise). It sounds creepy, and is rare, but should be a major concern of anyone who makes or sells roman shades, not to mention any one with children and shades in their home. Apparently, there are a lot of workroom readers. I didn’t know that either! And I’m honored to have y’all here. I’m just finishing up my 20th years in business. Before that I worked for someone for four years. I think I mentioned this before, but they do not teach any of this in interior design school! Shocking, I know. There are so many variations and methods and supplies in window treatments, its a constant learning process for workrooms. It is also why I find it such an stimulating profession. Now time for this sewing nerd to stop typing!! Oh gosh. That is a sticky wicket for sure regarding price. It depends on a lot of factors such as the geographical location and experience of the workroom. Is it one person or many people? Do they work out of their home or do they have a hefty overhead? The other thing is size. Most designers and/or workrooms charge by the square foot and then there’s installation. On top of that is the fabric and any trim work. I’m so honored to have you here! I always hope I have my facts straight. I think most people don’t have a clue about what goes into making window treatments. Laurel, your blog posts are so informative (and beautiful). Great article! I wish you well on the two awards you are up for and I cannot wait to see your paint collection!! Thank You for the pictures of all the roman shades. they are my all time favorites. Sorry, but I am working feverishly on it to have it ready by the 23rd. Believe me when I tell you that I am obsessing on each color–144 of them. Final answer. (I think) I started working on this last summer! It’s not going to be just a list of colors. There’s going to be a lot of detailed info about each color + what trim colors to use and a lot more. Phase II, I’ll be putting the colors into palettes. Each color will have its own palette. Phase III will be combining each palette with wood colors, stone, tile and one fabric to make the selection process much easier. These will be for sale, but the price won’t be more than a gallon of premium paint for each of the products. Thank you Christine! My mother actually DID wash my mouth out with soap when I was four.